You will be spellbound by Amsterdam's pretty canals, houseboats and narrow, cobbled streets. Take the opportunity to discover every corner of the town by exploring on foot or by bicycle. What will your mantra be? Finding the best chocolate spots in town! We have good news for you: we've picked out the essentials for every food lover in need of a chocolate fix. You're searching for your guilty pleasure. So what's the problem? It needs to be vegan! Not to worry, as one of the places in Amsterdam people are talking about specialises in just this. Mumu, a charming cafe and confectioner's, only makes sweet treats which are dairy-free and contain no animal products. This will take you to seventh heaven without feeling guilty! True chocolate fans simply must take a few days' holiday during the Chocoa Festival, which is held each year in Amsterdam. Over the course of a weekend, you can attend conferences, workshops and tastings, all about chocolate. It is a great opportunity to learn about chocolate production and how your favourite sweet treat is made. An event suitable for adults and children alike! One of the best chocolate shops in Amsterdam sits between two canals. Praline lovers will delight in discovering the impressive choice offered by this excellent chocolate shop in the centre of town. Difficult to resist... Our recommendations? Make sure you try the apricot marzipan, rhubarb and Amaretto or maybe even the Gianduja, lemongrass and thyme. Designed to look more like a gallery than a shop, Chocolátl offers a feast for the eyes with its original, high-quality selection of chocolates. Here you will taste wonderful handmade chocolates. You can also book a tasting at Chocolabs, which gives you a fun introduction to the world of chocolate. At the heart of Amsterdam's main station, take a break from the rush to taste one of the best chocolate fondues in the world. 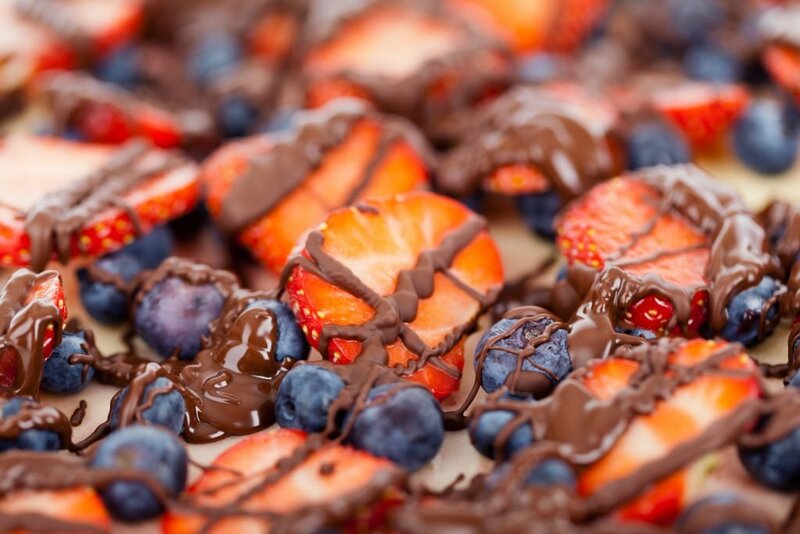 Your mouth will water at the mere thought of this fondue served with a selection of strawberries and other fresh fruits! For those who wouldn't dream of sharing their dessert, give in to the call of the famous 'Killer Brownie'. A dessert that lives up to its name! Spend some time exploring this lovely chocolate shop located in the heart of Amsterdam's town centre, just a few steps from the famous Oude Kerk church. You will find daring creations which will tempt your taste buds: mandarin, mango, raspberry, vanilla and even ginger. Here, handmade chocolate comes in every imaginable shape and combination. Urban Cacao is where your wildest chocolate dreams will come true. Mint, lavender, passion fruit and jasmine, lemon... the choice is huge and it's hard to leave this cave of wonders empty-handed. Fortunately, there are pretty selection boxes on sale, otherwise it would be impossible to choose! Looking for a gift? Fall in love with bars of Fair Trade chocolate, packaged in beautiful printed paper. You will have noticed that Amsterdam's chocolate makers love originality. At Van Velze's, you can taste combinations you would never have imagined. The chocolates combine the tangy bitterness of cranberry with the spiced taste of cardamom and marry mild chilli with balsamic. In short: fireworks for the taste buds with chocolate in the spotlight! Originality knows no limits in this shop located in the heart of Amsterdam. Here you can admire white chocolate swans, peanut-shaped pralines and traditional clogs filled with petits fours. Depending on the time of year, this chocolatier also offers seasonal creations: chocolate skulls for Halloween, snowmen at Christmas and pastries decorated with small pink sugared hearts for Valentine's Day. What could be nicer than enjoying an ice cream while strolling along Amsterdam's famous canals? Take a trip to Jordino, a chocolatier and ice-cream maker, where even the cones are made using chocolate. Fashionistas can eat chocolate high heels covered in coloured sugar pearls! 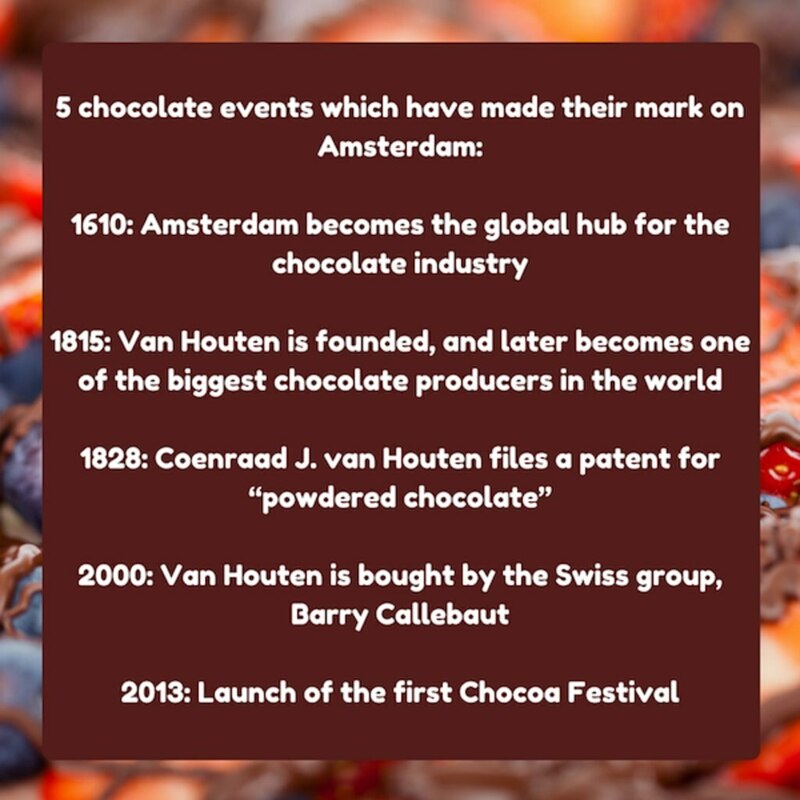 Born in 1801 in Amsterdam and the son of a chocolatier, van Houten was a chemist whose work was inspired by his father's work. In 1828, he filed a patent for "powdered chocolate". He invented a way of extracting the cocoa butter so that a powder could be produced from it - which proved especially useful for making hot chocolate.